Women in the U.K. are paid less than men, even when factors such as experience, job, location and title are taken into account, according to data from Glassdoor. Female workers on average earned 5 percent less than their male counterparts when figures were adjusted to reflect employee and job characteristics, a report by the jobs website published Wednesday showed. These factors included age, education, years of experience, occupation, industry, location, company and job title. The adjusted number is down from 5.5 percent three years ago and compares to an unadjusted 17.9 percent. While the majority of the wage gap could be accounted for by such details, Glassdoor found that 39 percent could not be explained by factors observable in their data -- meaning it could come down to things like workplace bias and negotiation differences between men and women. 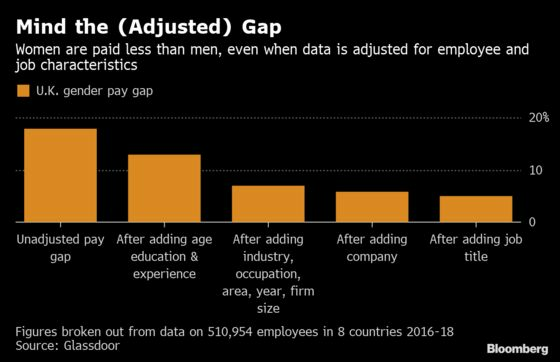 The U.K. legally requires larger companies and public agencies to publish a blunt, unadjusted assessment of the difference between what the genders earn on average each year, but some firms say an adjusted figure gives a more realistic and useful view. The Glassdoor research was based on just over half a million salaries shared by employees from eight countries over the period 2016-2018.